Individual state data protection laws are unique in several ways. For example, Massachusetts has extended its reach well beyond its own borders by mandating data protection for its citizens regardless of where that data resides. On the other hand, most other state laws, do not define what methods shall be used (e.g. , encryption) to protect its citizens' data. In addition, the Massachusetts law provides for large civil penalties in the case of non-compliance, and opens organizations to seemingly unlimited civil action. While it is not yet clear how this law will in fact be enforced, it is clear that any organization with customers in Massachusetts will be facing a tough new data protection environment. And as such, it behooves these organizations to start preparing now, to ensure not only compliance with this new law but to drive towards true data security and peace of mind. Define and track changes to various policies, procedures and controls related to access rights. Track ongoing violations to the policies and processes related to access rights. Monitor the timeliness of violation or exception detection mechanisms and the corresponding remediation activity. Audit access activity for all resources hosting sensitive information. Analyze unauthorized attempts to access or change sensitive information. Analyze the incremental effectiveness of controls around access rights. 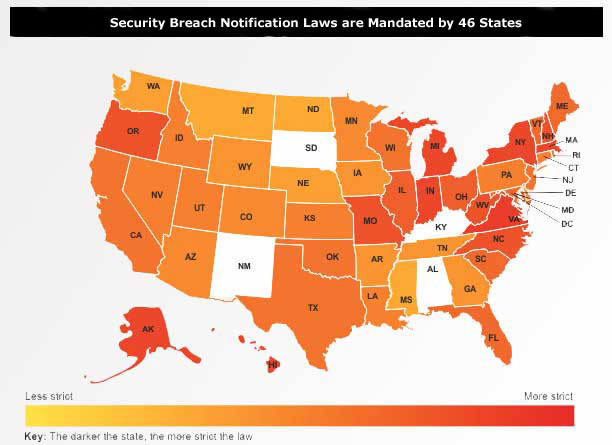 The graphic clearly depicts the magnitude of the current situation and the table provided by The National Conference of State Legislatures includes links to the individual states.The Security Manual Template address each of these mandate requirements. This regulation affects companies that do business with individuals living in California even if the ENTERPRISE is located outside of the state. If unencrypted personal data is compromised, then ENTERPRISE must immediately disclose to the customer that a security breach has occurred. Janco offers a full range of tools to help enterprises of all sizes to address these issues. The Compliance Management kit provides the infrastructure tools necessary address these mandated requirements. Security Audit Program - fully editable -- Comes in MS EXCEL and PDF formats -- Meets ISO 27001, 27002, Sarbanes-Oxley, PCI-DSS and HIPAA requirements -- Over 400 unique tasks divided into 11 areas of audit focus which are the divided into 39 separate task groupings including BYOD.